Matter is anything that has mass and takes up space. The term refers to all real objects in the natural world, such as marbles, rocks, ice crystals, oxygen gas, water, hair, and cabbage. The term states of matter refers to the four physical forms in which matter can occur: solid, liquid, gaseous, and plasma. Our understanding of the nature of matter is based on certain assumptions about the particles of which matter is composed and the properties of those particles. This understanding is summarized in the kinetic theory of matter. at the tiniest units of which a piece of aluminum metal is composed, one would be able to observe aluminum atoms. Similarly, the smallest unit of a sugar crystal is thought to be a molecule of sugar. The fundamental particles of which matter is composed are always in motion. Those particles may rotate on their own axes, vibrate back and forth around a certain definite point, travel through space like bullets, or display all three kinds of motion. The various states of matter differ from each other on the basis of their motion. In general, the particles of which solids are made move very slowly, liquid particles move more rapidly, and gaseous particles move much more rapidly than either solid or liquid particles. The particles of which a plasma are made have special properties that will be described later. Solid, liquid, and gas: these are the three most common forms of matter. But some materials do not fit neatly into one of these three categories. Liquid crystals are one such form of matter. Liquid crystals are materials that have properties of both solids and liquids. They exist at a relatively narrow range of temperatures. At temperatures below this range, liquid crystals act like solids. At temperatures above the range, they act like liquids. The behavior of liquid crystals is due to the shape of the molecules of which they are made. You can think of those molecules as looking like cigars or pencils: they tend to be long and thin. They can be arranged within a material in one of three forms. In nematic crystals, the molecules are all parallel to each other but are free to move back and forth with relation to each other. The molecules in smectic crystals are also parallel to each other but they do not move back and forth; they are, however, further arranged in layers that do pass over each other. And the molecules in cholesteric crystals occur in highly structured layers that are set at slightly different angles than the ones above and below them. The interesting property about liquid crystals is the way they transmit light. Light can pass through a liquid crystal more easily in one direction than in another. If you look at one of the crystals from one direction, you might see all the light passing through it. But from another direction, no light would be visible. The crystal would be dark. The arrangement of molecules in a liquid crystal can be changed by adding energy to the crystal. If you warm the crystal, for example, molecules may change their position with relation to each other. This fact is utilized in new kinds of medical thermometers that change color with temperature. As body heat changes, the molecules in the liquid crystal change, the light they transmit changes, and different colors appear. Liquid crystals are also used for the display in electronic calculators. When you press a button on the calculator, you send an electric current through the display. The electric current causes molecules in the liquid crystal to change their positions. More or less light passes through the crystal, and numbers either light up or go dark. The motion of the particles of matter is a function of the energy they contain. Suppose that you add heat, a form of energy, to a solid. That heat is used to increase the speed with which the solid particles are moving. If enough heat is added, the particles eventually move rapidly enough that the substance turns into a liquid: it melts. One can distinguish among solids, liquids, and gases on two levels: the macroscopic and submicroscopic. The term macroscopic refers to properties that can be observed by the five human senses, aided or unaided. The term submicroscopic refers to properties that are too small to be seen even with the very best of microscopes. On the macroscopic level, solids, liquids, and gases can be distinguished from each other on the basis of shape and volume. That is, solids have both constant shape and constant volume. A cube of sugar always looks exactly the same as long as it is not melted, dissolved, or changed in some other way. Liquids have constant volume but indefinite shape. Take 100 milliliters of water in a wide pan and pour it into a tall, thin container. The total volume of the water remains the same, 100 milliliters, but the shape it takes changes. Finally, gases have neither constant volume nor constant shape. They take the size and shape of whatever container they are placed into. Suppose you have a small container of compressed oxygen in a one-liter tank. 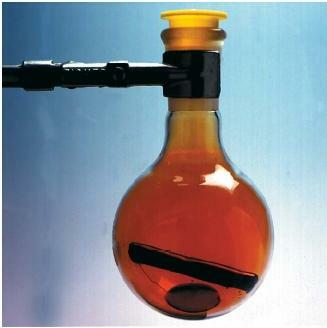 The volume of the gas is one liter, and its shape is cylindrical (the shape of the tank). If you open the valve of the tank inside a closed room, the gas escapes to fill the room. Its volume is now much greater than 1 liter, and its shape is the shape of the room. These macroscopic differences among solids, liquids, and gases reflect properties of the particles of which they are made. In solids, those particles are moving very slowly and tend to exert strong forces of attraction on each other. Since they have little tendency to pull away from each other, they remain in the same shape and volume. The particles of a liquid are moving more rapidly, but they still exert a significant force on each other. These particles have the ability to flow past each other but not to escape from the attraction they feel for each other. The particles of a gas are moving very rapidly and feel very little attraction for each other. They fly off in every direction, preventing the gas from taking on either definite shape or volume. Plasma is considered to be the fourth state of matter. Plasmas have been well studied in only the last few decades. They rarely exist on Earth, although they occur commonly in stars and other parts of the universe. A plasma is a gaslike mixture with a very high temperature. The temperature of the plasma is so high that the atoms of which it is made are completely ionized. That means that the electrons that normally occur in an atom have been stripped away by the high temperature and exist independently of the atoms from which they came. A plasma is, therefore, a very hot mixture of electrons and positive ions, the atoms that are left after their electrons have been removed. This is a cool website I do not know how long 50 characters is but I will try to write as much as the other coment.